SAN FRANCISCO — Hatsuro “Hats” Aizawa, a long-time leader in the Japanese American community, passed away on Oct. 20. He was 89. 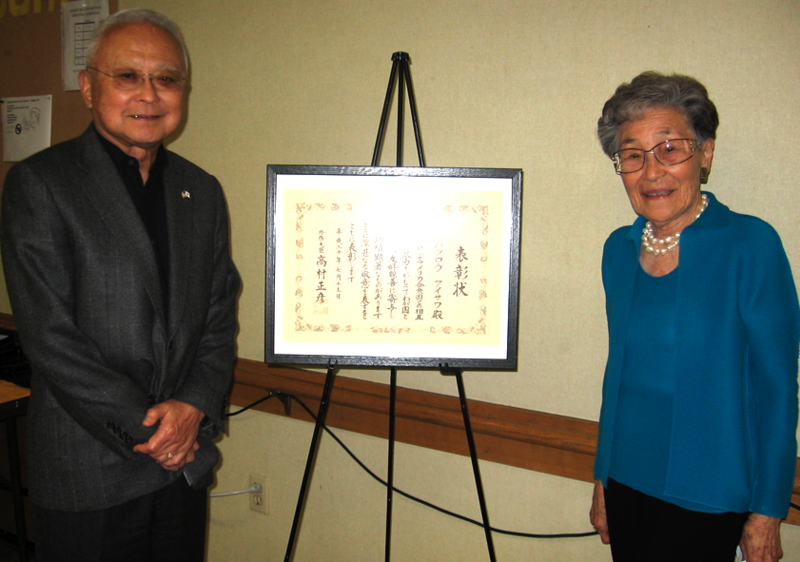 Aizawa was a founding board member of the San Francisco Japantown Foundation, and he and his wife Amey were among the original major donors that helped establish the foundation in 2006. “We express our deepest and heartfelt condolences to Amey and the Aizawa family. Hats will be sorely missed,” the foundation said in a statement. He and his wife have spent a lifetime serving Japantown and the Japanese American community through leadership of numerous organizations. “(My father) had a bookstore that sold nothing but Japanese books. Everybody gathered there, playing cards or reading the books. We were always poor because nobody bought any books. They just stood there and read the books and went home. I didn’t work in the store as such, but I got paid 35 cents a month to deliver books. My father used to stay late. He would close the store at 11 o’clock at night and then he would come upstairs. We would wait for him to finish and then we would go out with him to eat. “The war was economically devastating for us. We had to shut down the store. I remember cleaning up all those books and getting ready for evacuation. We could only take what we could carry. “We always felt that we had to come back to San Francisco. This was our home, regardless of how we had been treated. Everything I remembered about San Francisco was very dear to me. After the war, we were here about four or five years before we were able to come back to our community in the heart of J-Town. After the war, Aizawa studied painting at UC Berkeley, then ran his own advertising and graphic art business — Aizawa Associates and later Aizawa & Furuta — for over 45 years. He served 25 years on the Japan Society of Northern California Board of Directors, and was a member of the San Francisco-Osaka Sister City Committee. He was also active with the Nichibei Kai and the Japanese Cultural and Community Center of Northern California. As a commissioner and later trustee of the Asian Art Museum from 1988 to 2008, he helped introduce Japanese art to the American public. As a board member and vice president of the Japanese Chamber of Commerce of Northern California from the 1960s, he provided support to Japanese companies as they started and developed their business in Northern California. In 2006, he co-chaired the Japantown Centennial Steering Committee, which planned a series of events celebrating the 100th anniversary of Japantown’s establishment in its present location. In recognition of Aizawa’s many contributions, the Consulate General of Japan in San Francisco presented him with the Foreign Minister’s Commendation in 2008. In 2011, the consulate conferred on him the Order of Rising Sun, Gold and Silver Rays, one of the Japanese government’s highest honors. In addition to his wife of 67 years, Aizawa is survived by his brother and sister-in-law, Seiji and Vivian Aizawa; sister and brother-in-law, Kashiwa and George Hatamiya; and many nieces, nephews, grand-nieces and grand-nephews. A “Celebration of Life” will be held on Saturday, Nov. 2, at 2 p.m. at the JCCCNC, 1840 Sutter St. 49ers festive attire is welcomed. In lieu of flowers, the family requests that memorial donations be made to the JCCCNC or the Japantown Foundation.